Jerusalem Post. Fri, 19 Apr 2019 16:57:39 GMT. Times of Israel. Fri, 19 Apr 2019 10:42:45 +0000. Karen Schwartz. The Independent. Fri, 19 Apr 2019 08:33:28 GMT. Yahoo. Fri, 19 Apr 2019 03:50:53 -0400. Georgina Robinson. Sydney Morning Herald. Fri, 19 Apr 2019 16:54:45 +1000. Daily Mail. Thu, 18 Apr 2019 20:20:11 GMT. Karen Schwartz. New York Times. Thu, 18 Apr 2019 20:11:28 GMT. PR Newswire. Thu, 18 Apr 2019 11:17:00 +0000. ABC News. Wed, 17 Apr 2019 23:33:27 -0400. Tass. Thu, 18 Apr 2019 02:44:40 +0300. Juliegrace Brufke. The Hill. Wed, 17 Apr 2019 23:30:23 +0000. Al Jazeera. Wed, 17 Apr 2019 20:59:46 GMT. JERUSALEM (AFP) - Israeli President Reuven Rivlin on Wednesday (April 17) formally handed Benjamin Netanyahu his letter of appointment to start building a coalition government following last week's general election. Straits Times. Thu, 18 Apr 2019 02:24:52 +0800. Israel's president has formally nominated Benjamin Netanyahu for a fourth consecutive term as prime minister. France 24. Wed, 17 Apr 2019 17:39:31 GMT. A flight attendant in Israel is in a coma after getting the measles, according to news reports. Live Science. Wed, 17 Apr 2019 10:50:00 EDT. Reuters. Wed, 17 Apr 2019 09:05:14 -0400. 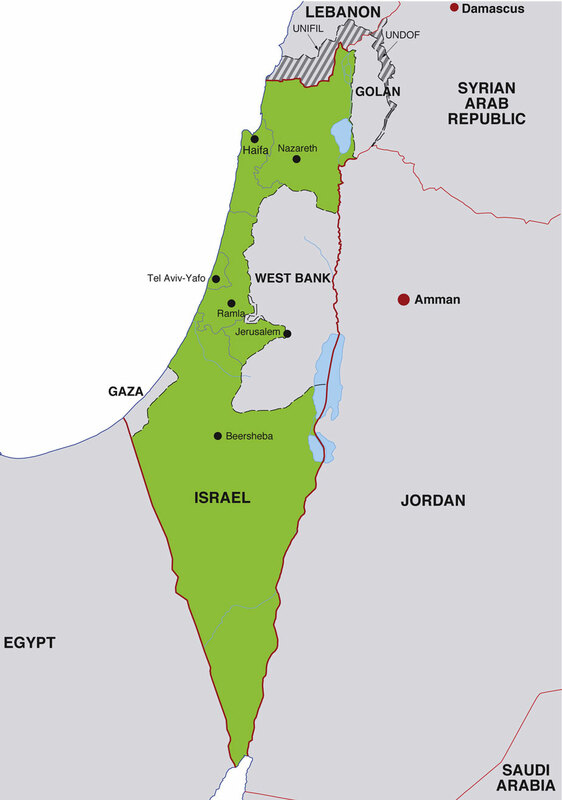 The State of Israel is a democratic republic which is located in the Middle East, between Egypt and the Mediterranean Sea to the west, Jordan and Syria to the east, and Lebanon to the north. Its capital city is Tel Aviv, and its national currency is the Shekel. The primary languages spoken in Israel are Hebrew and Arabic, and in 2007, Israel's estimated population was 6,427,000. Approximately 80% of Israel's residents are Jewish; about 20% are Arab and other ethnicities. For more news and information about Israel, visit this official Israeli government website. Click on the small Israel map shown at right to display a full-size map of Israel.